If you are looking for a specific part, we will be happy to list that item for you. Only you can see what it costs on your end. Brake pedal approx: 15.5 x 13.5 x 8 cm. Accelerator / Clutch Pedal approx: 20 x 6.6 x 4 cm. Universal Fit For Honda /Acura Vehicles With Automatic transmission Honda. Material: Aluminum. Gas Pedal Linkage. 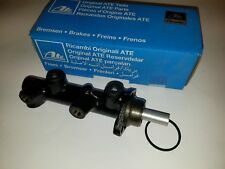 Being sold for parts because one outer end plastic is broken, also rod is slightly bent. We specialize in antique cars and parts! if you are looking for a specific part, we will be happy to list that item for you. It has no play on the shaft. 2Pcs Car Auto Automatic Gas Brake Non Slip MT Pedal Cover Set Silver Tone. Integra RSX DC5. Universal Fit For Honda /Acura Vehicles With Automatic transmission. Models for reference only. May also fit for other models. 3PCS Car Non-slip Aluminum Alloy Accelerator Pedal Foot Pedals Pad Cover For Brake Clutch Universal. 3PCS Car Aluminum Foot Pedals. Main Material: Aluminum Alloy Anti-skid PVC Rubber Board. Product color: Silver Black. EXTRA LARGE STREET ROD THROTTLE GAS PEDAL ALUMINUM CHEVY FORD POLISHED SBC 350 from Johnny Law Motors... Shape :: Oval Material :: Aluminum Finish :: Chrome Feature :: Rubber Insert Pad Mount :: Floor. [KP00020CH] Covercraft Pet Pad Universal Coal Bench Seat Approx. Part Number: KP00020CH. Bench Seat; Quilted Finish Backed With PVC Coated Polyester; Coal Black; Single. Manufacturer: Covercraft. Seat Style: Bench Seat. Johnny Law Motors advanced pedal assemblies offer a unique internal tension spring to ensure optimal performance and engine feedback. Aluminium alloy APC Non-Slip 3pc Foot Pedals Pad Covers Manual Transmission M/T for Brake Clutch Accelerator Black Universal. 3pcs X Car Foot Pedal. Material: Aluminium alloy PVC. Non-slip surface design, safe for driving and reduce foot fatigue. Johnny Law Motors advanced pedal assemblies offer a unique internal cable attachment to ensure optimal performance and engine feedback. 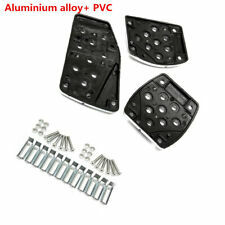 Category :: Pedal Pad Kits ---------------------- :: Gas Pedal Shape :: Oval Material :: Aluminum Finish :: Chrome Feature :: Rubber Insert Pad Mount :: Floor ---------------------- :: Brake/Clutch Pedal Pads Size :: 6" x 2.5" (152.4mm x 63. EXTRA LARGE STREET ROD THROTTLE GAS PEDAL ALUMINUM CHEVY FORD POLISHED SBC 350 Shape Oval Material Aluminum Finish Chrome Feature Rubber Insert Pad Mount Floor. 3PCS Car Non-slip Aluminum Alloy Accelerator Pedal Foot Pedals Pad Cover For Brake Clutch Universal. [Manual gear size] (throttle) 140 62 8 mm (brake, clutch) 75 69 8 mm. [Main Material] Aluminum Alloy Anti-skid PVC Rubber Board. 3pcs X Car Foot Pedal. Non-slip surface design, safe for driving and reduce foot fatigue. Suitable for car automatic. We have warehouses in the USA, CA, and AU. Detail image. Oval Gas Pedal Assembly - Firewall Mount rod hot rod rat hot street v8 muscle V8 Pedal Oval Material Alloy Finish Chrome Construction Heavy Duty Feature Reinforced Mounting Plate Feature Traditional "Spoon" Style Feature Firewall Mount. 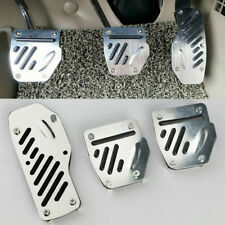 3PCS Car Non-slip Aluminum Alloy Accelerator Pedal Foot Pedals Pad Cover For Brake Clutch Universal. [Main Material] Aluminum Alloy Anti-skid PVC Rubber Board. [Manual gear size] (throttle) 140 62 8 mm (brake, clutch) 75 69 8 mm. Non-slip surface design, safe for driving and reduce foot fatigue. 3pcs X Car Foot Pedal. Suitable for car automatic. Johnny Law Motors advanced pedal assemblies offer a unique internal cable attachment to ensure optimal performance and engine feedback. 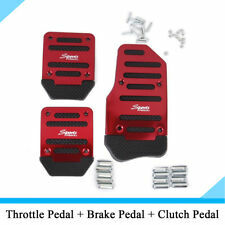 Category :: Pedal Pad Kits ---------------------- :: Gas Pedal Shape :: Oval Material :: Aluminum Finish :: Chrome Feature :: Rubber Insert Pad Mount :: Floor ---------------------- :: Brake/Clutch Pedal Pads Size :: 3" (76. 3PCS Car Non-slip Aluminum Alloy Accelerator Pedal Foot Pedals Pad Cover For Brake Clutch Universal. [Main Material] Aluminum Alloy Anti-skid PVC Rubber Board. We have warehouses in the USA, CA, and AU. Johnny Law Motors advanced pedal assemblies offer a unique internal cable attachment to ensure optimal performance and engine feedback. Category :: Pedal Pad Kits ---------------------- :: Gas Pedal Shape :: Oval Material :: Aluminum Finish :: Black Feature :: Rubber Insert Pad Mount :: Firewall ---------------------- :: Brake/Clutch Pedal Pads Size :: 3" (76. 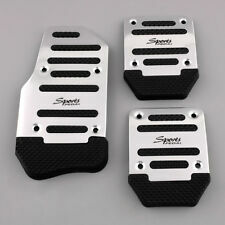 3PCS Car Non-slip Aluminum Alloy Accelerator Pedal Foot Pedals Pad Cover For Brake Clutch Universal. [Manual gear size] (throttle) 140 62 8 mm (brake, clutch) 75 69 8 mm. (For 90% models, Specific size comparison). Johnny Law Motors advanced pedal assemblies offer a unique internal cable attachment to ensure optimal performance and engine feedback. 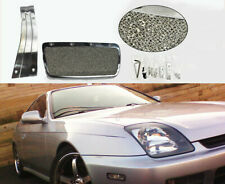 Category :: Pedal Pad Kits ---------------------- :: Gas Pedal Shape :: Oval Material :: Aluminum Finish :: Chrome Feature :: Rubber Insert Pad Mount :: Firewall ---------------------- :: Brake/Clutch Pedal Pads Size :: 6" x 2.5" (152.4mm x 63. Johnny Law Motors advanced pedal assemblies offer a unique internal cable attachment to ensure optimal performance and engine feedback. Category :: Pedal Pad Kits ---------------------- :: Gas Pedal Shape :: Oval Material :: Aluminum Finish :: Black Feature :: Rubber Insert Pad Mount :: Floor ---------------------- :: Brake/Clutch Pedal Pads Size :: 4.5" x 2" (114.3mm x 50. Johnny Law Motors advanced pedal pad assemblies offer a true fit design to ensure optimal performance and fitment. Item is made from rubber that will allow a long life of smooth operation even under the harshest conditions. Application :: Dimmer Switch Installation :: Mounts to Top Dimmer Switch Material :: Rubber Rubber Insert :: No Set Screw :: Yes Johnny Law Motors. Johnny Law Motors advanced pedal assemblies offer a unique internal cable attachment to ensure optimal performance and engine feedback. Category :: Pedal Pad Kits ---------------------- :: Gas Pedal Shape :: Oval Material :: Aluminum Finish :: Black Feature :: Rubber Insert Pad Mount :: Floor ---------------------- :: Brake/Clutch Pedal Pads Size :: 3" (76. Johnny Law Motors advanced pedal assemblies offer a unique internal cable attachment to ensure optimal performance and engine feedback. Category :: Pedal Pad Kits ---------------------- :: Gas Pedal Shape :: Oval Material :: Aluminum Finish :: Black Feature :: Rubber Insert Pad Mount :: Firewall ---------------------- :: Brake/Clutch Pedal Pads Size :: 6" x 2.5" (152.4mm x 63. Oval Gas Pedal Assembly - Firewall Mount rod hot from Johnny Law Motors... Pedal :: Oval Material :: Alloy Finish :: Chrome Feature :: Heavy Duty Construction Feature :: Reinforced Mounting Plate Feature :: Traditional "Spoon" Style Feature :: Firewall Mount. Johnny Law Motors advanced pedal assemblies offer a unique internal cable attachment to ensure optimal performance and engine feedback. Pedal :: Oval Material :: Alloy Finish :: Chrome Feature :: Heavy Duty Construction Feature :: Reinforced Mounting Plate Feature :: Traditional "Spoon" Style Feature :: Firewall Mount Johnny Law Motors. Johnny Law Motors advanced pedal assemblies offer a unique internal cable attachment to ensure optimal performance and engine feedback. Category :: Pedal Pad Kits ---------------------- :: Gas Pedal Shape :: Oval Material :: Aluminum Finish :: Black Feature :: Rubber Insert Pad Mount :: Floor ---------------------- :: Brake/Clutch Pedal Pads Size :: 6" x 2.5" (152.4mm x 63. Aluminium alloy APC Non-Slip 3pc Foot Pedals Pad Covers Manual Transmission M/T for Brake Clutch Accelerator Black Universal. Material: Aluminium alloy PVC. Non-slip surface design, safe for driving and reduce foot fatigue.